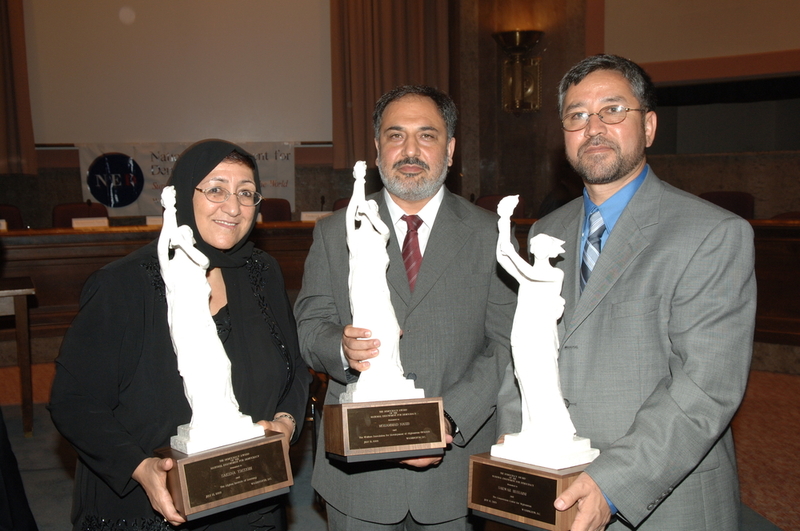 On July 13, the National Endowment for Democracy presented its annual Democracy Award to three democratic activists from Afghanistan. Ms. Sakena Yacoobi, Founder, Afghan Institute of Learning (AIL), Mr. Mohammad Nasib, Director, Welfare Association for Development of Afghanistan, and Mr. Sarwar Hussaini, Chairman, Cooperation Center for Afghanistan, are leaders of civil society organizations who have worked diligently to educate citizens and local leaders about the basic values and principles of democracy, the rights of women and ethnic minorities, strategies for peace-building and conflict resolution and the importance of broad political participation. We also wish to acknowledge the gracious assistance of Julie Finley, Tom Marsh, Amb. Said Tayeb Jawad and the Embassy of Afghanistan. Read Carl Gershman's closing remarks at the 2009 Democracy Award.